Liliana strode through the Morass under the hazy dawn light, the muddy grass dragging at her clothes. Ahead, a scatter of ravens took flight, bursting out of the shadows cloaking a dead tree. Furious, she shouted, "I know you're here! Face me, damn you!" She had been searching the marsh since dawn. It was full of foul distorted creatures created by the Cabal's spells, but each one who crossed her path learned who the real threat was. The Raven Man had to be here, had to know how Belzenlok had managed to turn Josu into his lich. She had thought of nothing else last night, when the innkeeper had half-carried a semiconscious Gideon back to their room, and she had used the herbs she had collected to heal his wounds. She had meant to do this for Josu all those years ago, to make him whole, to save her brother's life. It was easy to see now that she had been single-minded and selfish about it, ignoring warnings, rushing as if minutes were meaningful, wanting only to succeed where others had failed and make herself the hero of her family. But it was a teenager's selfishness, a childish self-absorption. It didn't deserve this. And while she had been working her healing on Gideon, she had been irrationally terrified it would happen again. That she would somehow kill or transform her only ally. But she had left him in the inn still recovering, whole and sleeping deeply. She had to find the Raven Man. She had to find answers. Above the trees ahead, ravens wheeled in the air, then dove to spiral into a dark whirlwind just above the ground. The rapid flap of their wings coalesced into a black mass, as if they had all joined together into one creature. Out of that mass stepped the Raven Man. He looked the same as the last time she had seen him, a tall pale figure dressed in black with hair white as bone and eyes of piercing gold. He had followed her across planes, making a pretense of wanting to help her, though she had no idea what his real motive was. She demanded, "Did you do this? Did you tell Belzenlok how my brother died? How did Belzenlok raise him again?" "You already know the answers to these questions, Lili," he said, his calm infuriating. "It's because of you." She stalked forward. There were ravens everywhere, perched on every rock or stump or rotted tree limb. They watched the confrontation silently, unmoving. She had never known what the Raven Man was, or why he was so determined to interfere in her life. He could be anything from a powerful Planeswalker to an elder dragon in human form. "You did this. Fix it. Lay Josu to rest." "It can't be done." His golden eyes regarded her calmly, as if her pain was amusing. "If you miss your brother so much, you should have agreed to follow me." Liliana's anger gathered in her chest, and at her side the Onakke spirits in the Chain Veil whispered. She rasped out, "For what purpose? What do you want of me?" He didn't answer, watching her thoughtfully while the damp wind stirred the birds' feathers. "Why stalk me from plane to plane? Why trick me into making my own brother undead when all I wanted was to help—" She felt her voice climb higher, as if it was about to break, and stopped. She took a breath. She wasn't vulnerable with emotion, she was raging with the desire to tear this creature apart, whatever he was. But she couldn't afford to show any sign that might be interpreted as weakness. He said, "I think you know why." The words fell into the silence of the marsh. Liliana didn't want to answer, couldn't answer. Did she know? She asked, "Were you trying to ignite my spark? Why did you want me to become a Planeswalker?" 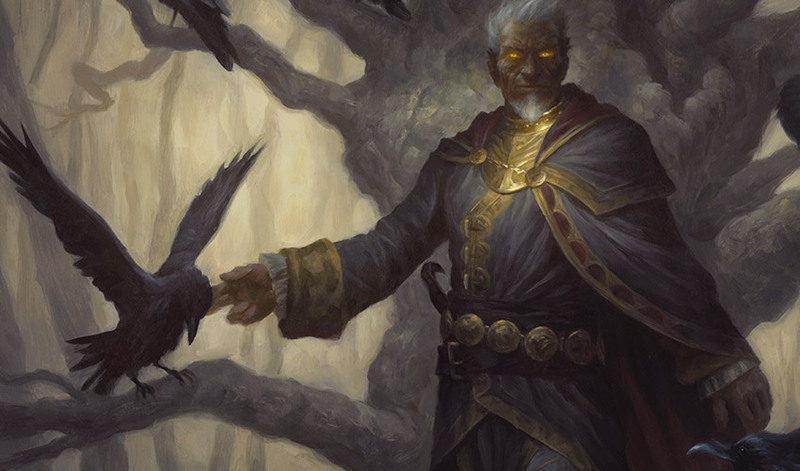 The ravens around him took flight and Liliana lunged forward. "Oh no, don't you—" Before she could lift a hand the birds swirled into motion and he and every raven in sight abruptly vanished. Liliana swore in thwarted fury. "Useless!" She paced hard, sending snakes and the foul little creatures of the Morass fleeing in terror. How could she help Josu? It wasn't just Belzenlok using her brother as a servant that rankled every bone in her body. It was her own healing work that went so terribly wrong all those years ago. The Raven Man had manipulated her, tricked her into performing the work, yes, but she was the one who had done it, the one who had turned Josu into a mindless undead remnant. And somehow it left his remains vulnerable to Belzenlok's magic, allowing Belzenlok to raise Josu from the grave once more, enslaving him, but with his wits and military knowledge intact. I could use the Chain Veil, she thought suddenly. Now that Josu was transformed into a lich, it would lay him to rest just as it would destroy a demon . . . She swore under her breath in realization. Oh, so that's it. That was Belzenlok's plan, his purpose in choosing Josu to lead his forces in Caligo. He knew if Liliana used the Chain Veil to unmake Josu, it would leave her so weak she wouldn't be able to use it to destroy Belzenlok. Her lips curled in contempt. Belzenlok's overconfidence was just as misplaced as hers had been, that long-ago day when Josu had died. When she had killed him. She would use the Chain Veil to unmake her brother. I am Liliana Vess, she thought. If there's a way to kill Belzenlok without the Chain Veil, I can find it. But first she had to get Josu back to Vess Manor, back to the spot where he had been made undead in the first place. Only there would the spell of unmaking work; only there could she lay him to rest. The morning sun was breaking over the patched roofs of the town when she reached the inn again. Townspeople were out in the plaza, some keeping watch while others shoveled out the burned market stalls. As she passed they nodded to her respectfully, and a few of the younger ones waved. She stared, nonplussed, and strode past them into the inn. She found Gideon awake and in the inn's garden court amid herb and vegetable beds. He was slowly moving through attack forms with a borrowed sword, clearly testing her work on his shoulder. She stopped in front of him, braced for a confrontation, her face set in a sneer, a cutting rejoinder ready. Gideon sheathed the sword and faced her. He said mildly, "News?" Gideon's brow quirked. "The innkeep said you'd gone out before dawn. I thought you were scouting out Belzenlok's forces." She made an impatient gesture. "I was looking for information, yes, but—" She took a sharp breath. She had expected Gideon to be ready to abandon her cause because Nissa and Chandra had. Because of who she was. But he hadn't, and she was a fool not to ask for his help. Walking back through the Morass, she had tried to think of a way to explain what she needed without telling him the truth, but every story she had come up with was more ridiculous than the last. She began reluctantly, "I have a problem . . . closer to home, shall we say. I told you I used to live here." It was unexpectedly hard to force the words out. "The lich leading the Cabal forces in this area is my brother, Josu." She wasn't sure what reaction she had expected. But Gideon said nothing. His brow furrowed in consternation and he slowly took a seat on a bench, gesturing for her to go on. Liliana paced the uneven stone of the court and found herself explaining. "I made Josu undead, many years ago. It was an accident. I was young, foolish, inexperienced. I was trying to heal him and . . ." She made a sharp gesture. "It happened. The spells, the dark magic, was part of what ignited my spark, and I involuntarily planeswalked away. I haven't been back here since. Yesterday when I went to look for herbs, I found evidence of a powerful necromantic spell in the ruin of my family home. Belzenlok must have somehow been able to raise Josu again to use against me." She stopped and faced him. "I need to lay my brother to rest." Again, she was expecting Gideon to leave. This was not what they had discussed and would not serve their goal of destroying Nicol Bolas. In Gideon's place, Liliana would have already been gone. But he nodded, his expression thoughtful. "Yes, that's our next step, obviously." "Belzenlok is using the Cabal to threaten all of Dominaria. If we can unmake Josu, not only will your brother be free, but the Cabal will lose his leadership in Caligo Morass. This will give the Benalish forces a chance to regroup and force Belzenlok and the Cabal off Aerona." Gideon glanced up at her and smiled grimly. "It's a good start." Braced to argue, to make her case, she was left flailing by his agreement. She paced away, trying to get her thoughts together, and remembered she hadn't told him the worst part yet. "I'll need the Chain Veil to unmake Josu. After that, I won't have the strength to use it against Belzenlok." Gideon considered that for a moment. "That can't be helped. We'll have to think of another way to destroy Belzenlok." He shrugged a little. "Nothing about this was ever going to be simple, or easy. We both knew that." Liliana pressed her lips together. It was stupid to feel an annoying ripple of emotion. Gideon was being practical. She was just lucky that they temporarily shared the same goal. She said, "I'll need to get Josu back to Vess Manor to unmake him, but I'm not sure how. He's leading the Cabal forces, surrounded by them." Gideon pushed to his feet. "For that, I think I know exactly what we need to do." Gideon led the way into the marsh, using the directions he had gotten from the innkeeper and the other leaders of the town's defenses. 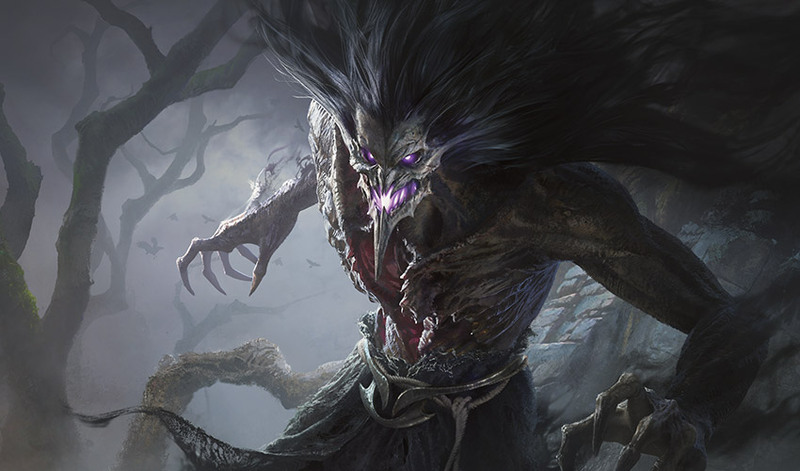 As they followed the barely discernible path between stagnant pools and the heaped remains of rotting trees, he told Liliana, "Josu and the Cabal defeated a large Benalish force not far from here just a few days ago. Some of their wounded are still being sheltered in the town, and others have gone to ground in small groups all over this area. If we rally them and make Vess Manor our staging ground, Josu will have to come attack us there." "Your optimism is boundless," Liliana said, a tinge of mockery in her voice. "I can tell you're upset," he told her. "You're not putting much effort into your insults." "I'm not upset!" Liliana snapped. "I'm . . . plotting. Why should these people listen to us?" "Well, that's my job," Gideon said. Ahead stood a perfectly round stone platform, surrounded by tall grass. Near it, three smooth columns, each a good sixty feet high, formed a half-circle. It was the remains of an ancient ruin, a place that had once been surrounded by heavy forest but was now exposed and partially sunken into the marshy ground. Dying vines clung to the upper portions, but like the other ancient structures Gideon had seen here, the stone was unstained and unweathered. Perched on the center column was the person Gideon had come to see. It was an angel, with skin like burnished bronze and hair a dark cloud. Her wings were half-extended, the brilliant white feathers shading down to dark gray at the tips. She wore plate armor over chain mail and the sword that lay at her feet was nearly as tall as Gideon. He called up to her, "Will you speak with us? Gerrel, innkeeper of the town of Vess, sent us here to find you." For a moment he thought she wouldn't answer. Then her wings extended fully and she rose, stepping off the column. She landed lightly, her knees flexing to take the weight. This close, he could see her white tabard was stained with blood and her armor bore the dents and scrapes of recent battle. Her face expressionless, she said, "Who are you?" "I'm Gideon Jura and this is Liliana." They had decided not to tell anyone of Liliana's past association with Vess. Gideon already had enough to cope with. "We know you're Rael, Battle Angel and Protector of Caligo. You led the Benalish forces against the Cabal here." Rael said flatly, "Then you know I failed." "You lost a battle," Gideon told her. "It doesn't mean you failed." Her brows lifted, a little life coming into her expression. It was irritation, but at least it was life. Her voice tinged with irony, she said, "Platitudes will not stop the Cabal." "Yes, he's very annoying that way," Liliana said, folding her arms. "But we're here to offer you our help." "You should have arrived earlier." Rael's grim gaze moved from Gideon to Liliana, evaluating them. "My forces are scattered, in hiding. If I engage the Cabal again, they'll be destroyed. Let them defend themselves and their own as best they can. We can't defeat the Cabal here in open battle." "I understand, but it's not just strength of arms we're here to offer," Gideon said. 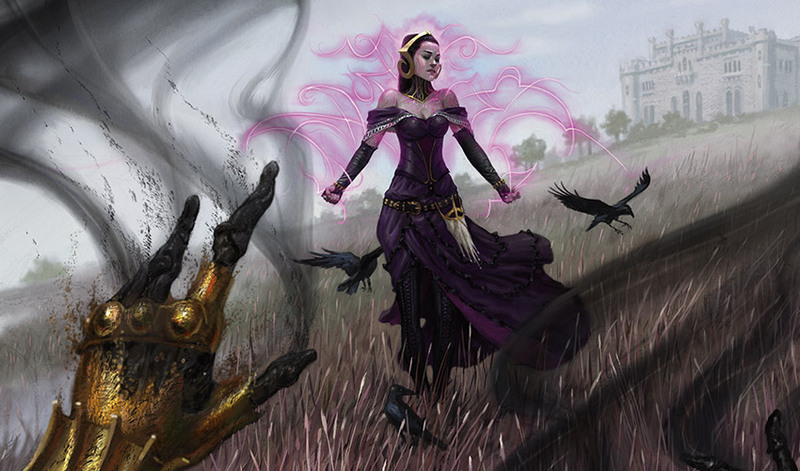 "Liliana is a powerful mage, and she destroyed the undead knights who attacked Vess last night. With your help, we have a way to defeat the lich Josu who commands the grimnants here." Rael's dark brows lowered. "You know the name of their commander?" Gideon glanced at Liliana, whose expression gave nothing away. "Not only that, we have a way to lay him to rest." Rael hesitated, and in her expression hope warred with resignation. Gideon watched hope win out. She took a deep breath, and said, "Tell me your plan." While Liliana prepared for her spell, Gideon spent the rest of their day with Rael, gathering the Benalish forces left in Caligo. When the next day dawned, they were at the high ground around Vess Manor with a small force of Benalish soldiers, knights, and aven scouts. The sky was heavy with clouds, threatening rain, as Gideon and Liliana met with Rael and her lieutenants in the overgrown remnants of the house's walled garden. Looking around at them all, Gideon knew he would need a good defensive strategy. Too many of the soldiers and knights were walking wounded, too many were disheartened by the deaths of their companions and the devastation the Cabal had caused in Caligo. He had no intention of letting them bear the brunt of the attack. "Are there any other mages here?" Gideon had asked earlier. "There's Corin." Rael had pointed to a small pale figure standing with the Benalish soldiers. "He's a Tolarian mage." Corin seemed very young and dispirited, his robes dragging in the wet grass. He had some sort of crystal and metal artificer's gauntlet on one arm, but he didn't look formidable. "I see," Gideon said, and nodded politely, privately deciding to try to come up with a plan that didn't include mages. It was true that laying Josu to rest would deprive Belzenlok of his general in this part of Benalia, but it was also a vital part of Gideon's plan to kill Nicol Bolas. He couldn't let these weary people take the brunt of a battle to further his goals, even if those goals would ultimately benefit their plane. Of course, Gideon was well aware that his defensive strategies largely consisted of throwing himself between whatever was attacking and his companions. It was still the best solution if he couldn't think of anything else. "Why are we meeting here?" asked Thiago, a Benalish knight who was Rael's second in command. He glanced up at the lichen-covered stone wall looming over them. "This house is cursed. It can't be a good spot to stage a battle against the Cabal." "The curse will end when I unmake the lich," Liliana told him. Her expression was cool and arch, as if nothing they discussed here affected her personally, but Gideon knew better. She had tried her best to keep her emotions in check when she told him about Josu, but he knew her just well enough to sense the real horror and dismay she felt. She might have used the moment to lie or try to manipulate him, but she hadn't. 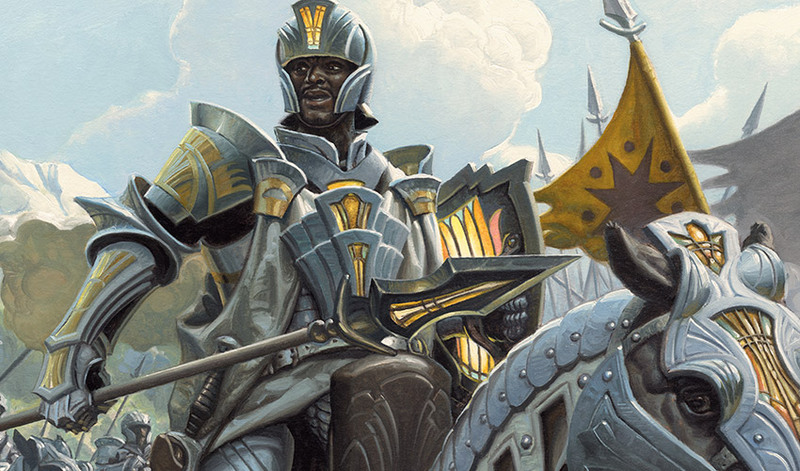 It had surprised him, and made him think they might actually have a chance to kill Belzenlok and then Nicol Bolas. If they could really work together as allies, anything was possible. She added, "The spell has to be performed here." The captain of the soldiers asked, "The lich was created by the curse of Vess?" Gideon had no idea. He glanced at Liliana, who said, "It doesn't matter how it was created. This is where I'll destroy it." An aven brought Rael a map, and she unrolled it on a stone table. It showed the Morass, the town, the river, and all the surrounding area. "The lich has a creature enslaved to him that he's used against us in Caligo. It's an undead remnant, a dread shade. There are also several skin witches in the lich's ranks." Gideon nodded. "What are the powers of these dread shades and skin witches?" "We're not entirely sure." Rael looked up at him, her mouth set in a grim line. "No one's ever survived to report back to us." Liliana said, "Oh, skin witches are nothing too unusual. They wield death magic, but are mostly concerned with peeling the skin from their victims." Gideon raised his brows in inquiry. Liliana clarified, "They wear it." Gideon sighed. "Of course they do." "You've seen a skin witch?" Thiago asked, incredulous. Rael eyed Liliana dubiously. "Several." Liliana adjusted one of her bracelets, apparently oblivious. Gideon prompted, "And dread shades?" Liliana said, "Now, those are more interesting. They can change size, so they're not only capable of becoming extremely large, they can also shrink down small enough to crawl inside a corpse and animate it." She waggled her fingers. "Rather like a puppet." Gideon kept his expression neutral as the others stared at Liliana, baffled by how she had come by this information. She glanced around at them and said, her voice dry, "I know things." After another thoughtful glance at Liliana, Rael continued, "The aven scouts have seen a dread shade coming from the riverside, here. It will be followed by grimnants and undead under their clerics' control. The lich will be somewhere nearby, waiting to move against us once the dread shade and the force with it attack." She straightened, shaking out her wings a little. "This means the skin witches probably won't take the field against us today. The lich has never before sent them into battle at the same time." "Even one dread shade is bad enough," Thiago commented. The captain said, "There's a first time for everything; we can't count on only facing one or the other." Gideon didn't want the Benalish forces to face any of the lich's creatures. He asked Liliana, "Could you control a dread shade?" Liliana frowned in thought. "Control, no. Not until Josu is . . . out of the way. What are you thinking?" Instead Gideon turned to look for the young mage. He didn't want to put Corin in harm's way, but his part in this strategy should be safe enough. "Corin, with Liliana's help, could you create an illusion? Make a dread shade think I'm a skin witch?" "Yes, I can do that!" Corin pushed forward between Thiago and the captain, apparently relieved to have some way to help. "I'm good with illusions." Liliana's mouth quirked as she studied the map. "Oh, I see what you're thinking. That's a delightful idea." Rael and the others left to get into position, and Gideon asked Liliana, "Are you ready for this?" Her expression was annoyed. "Of course I am. Now try to stay alive while I take care of Josu." Gideon sighed, and as she slipped away around the house, he went to join Corin. They had managed some quick preparations, but most of the plan depended on Corin's spells. As they went into the trees at the edge of the manor's grounds, Gideon slung the triple-bladed Cabal spear across his back. Rael had said it had a ritual purpose as well as being a weapon, which would lend more verisimilitude to his act. He hoped. If this didn't work, he would be facing a dread shade and the main Cabal force alone. That would be interesting. As Corin cast the spell, Gideon felt the illusion settle over him like a wet blanket. He looked down at himself, but couldn't see any difference. "I can't see it." "Because you're untouched by necromancy," Corin explained. "I've had to modify the illusion so a dread shade will be able to see it." He hesitated anxiously. "I hope it works." "I hope it does too," Gideon agreed, and wished Liliana was a Tolarian mage instead of a necromancer. He sent Corin to join the soldiers and headed away. As Gideon walked through the high grass, he felt it tug at him, as if he wore long skirts that dragged over it. An odd sensation, but it was proof Corin's spell was working to some extent. Pushing through the mud and the dense foul growth of brush, he made his way toward the river. Once he emerged from a vine-tangled copse of dead trees, he saw the stretch of flat ground leading up to the sea of mud that had once been the river. Among the stands of rotted trees, dark shapes moved purposefully. It was the Cabal force, a legion of the undead. Shambling corpses, the revenants of foot soldiers, carried looted weapons, and undead knights rode on creatures that had once been horses. Black-cloaked and black-armored grimnants and clerics strode among them. And leading the way . . . So that's what a dread shade looks like, Gideon thought. As if he didn't already have enough fodder for his nightmares. It stood easily twice Gideon's height, a gray figure naked to the waist, its body like a muscular, desiccated corpse. Its chest had been ripped open collar to waist, revealing an empty cavity that glowed with spectral light, below a pointed face with a wide fanged jaw. Gideon took a deep breath and started forward, lifting his hands. The shade halted, its head twisting from side to side, as if trying to see him better. A grimnant moved forward and called out, "Witch, what are you doing here? Why do you disobey the orders of our master?" Move fast and keep your big mouth shut, Liliana had advised him. You'll have very little time before the illusion draws Josu's attention and he'll know immediately what it is. Gideon strode forward, keeping his hands lifted, hoping his posture was witch-like enough. Suddenly in front of him he saw the shapes of Drasus and Olexo, his friends, his Irregulars from the Foreigners' Quarter in Akros, and his heart froze in his chest. They were undead, their bodies mutilated, bloodless corpses, brought here somehow by Belzenlok. Gideon almost fell back but steeled himself. No, it's not real. A Cabal cleric somewhere in the approaching force must be casting dementia magic over a wide area. The images were just nightmares, drawn out of his unconscious mind. The grimnant near the shade yelled, "That's not—"
Gideon lunged forward and cast the spear straight at the gaping hole in the shade's chest. It hit dead center and the shade staggered and roared in rage. Gideon ran and the shade rushed after him. Before he reached the trees, Gideon spared a glance upward to make sure the aven scout flying high overhead had seen him. The scout would signal Rael to send the Benalish force after the grimnants who had counted on the dread shade to lead the attack. The trick with shades like this, Liliana had told him, is that they're always hungry and their brains are like porridge. Antagonize it enough, and it'll chase you no matter what its orders are. Gideon pelted downhill. He dodged through a sodden copse of trees and slid to an abrupt halt. Facing him was a tall hag-like figure draped in the shredded remnants of human skins, with two others not far behind her. Skin witches. So Josu had sent all his most formidable weapons after them. Gideon's first thought was that he should dodge away and let the dread shade encounter the skin witches, thinking one of them had attacked it. Then he saw the faces of the skins tied around the closest witch's neck. Their eyes rolled and watered in pain and terror. Some foul magic kept her victims alive. So Gideon went with his second thought, and as she lifted her hands to cast a spell, he drew his sword and lunged. The witch blew out a breath and a cloud of dark poisonous air flowed toward Gideon. Reacting instinctively, he used his shield spell, the eternal aegis, and the poisonous air flowed around it, harmless. The first stroke of his sword took her head off. As the witch's surprised head bounced away through the grass and her body sunk to the ground, the dread shade burst out of the copse behind him. It leapt on the first skin witch it saw, snatching her off the ground and clasping her to the hole in its chest. The witch convulsed, her body jerking as it shrunk and crumpled; the dread shade was drinking the life force out of her. The last witch screamed in fury and threw another toxic cloud at Gideon. He used his shield spell again and stabbed her through the stomach, ripping his sword downward to gut her as she flung more spells. As she fell to the ground, Gideon felt the illusion around him vanish. He swung around to face the dread shade. I hope Corin's not dead, he thought. The young mage must have been incapacitated for the illusion spell to break like that. The dread shade stared at Gideon in incomprehension, then roared. The plan hadn't worked quite as intended, but the point was to keep the shade confused and away from the Benalish force. There was no reason Gideon couldn't continue to do that. He roared back at the startled shade and charged. Liliana stood at the edge of the manor's grounds. She heard fighting in the distance, saw the aven flying over the Morass. Not far away, she could hear Gideon killing something loud and angry, but she could spare no attention for anything but Josu. Then she felt something powerful approach. A cold wind rose over the marsh, stirring tall grass and rippling muddy pools, snapping the frail branches of dying trees. She traced its source, a concentrated center of necromantic power shot through with dementia magic. And a cold rage. Liliana could sense pieces of her brother in that rage, fragments of memory and a familiar presence. She knew better than to expect to speak to the man who had been her brother. Whatever was left of the real Josu's personality was buried, locked away under layers of Belzenlok's death magic. She turned her surge of emotion into a sharp blade of purpose; Josu's torment would end today and Belzenlok would lose his tool in Caligo. She sent words into the wind: Josu Vess, I am here. You know me. Josu's attention snapped to her, pinpointing her location. Anger and disbelief flowed through their connection. His answer came to her: This is a trick. She let the wind hear her laughter. Surely you know your own sister. A roar of psychic rage reached her and she turned away, walking over the wet earth toward the manor. She stopped just before the steps up to the main hall and looked back. Josu had moved out of the shadows of the trees. As he strode forward, she could see nothing of his face. The magic that had transformed him from a mindless undead remnant into Belzenlok's lich general had covered his shape with dark metal armor. Sharp spikes stood up from his shoulders and back, and the heavy helm concealed his features. He stopped in the center of the grassy mound that had been the house's forecourt. So it is you, sister. She answered, I wish I could recognize you as easily, brother. Your master has changed you. It was you who changed me. The rage colored his tone and perversely made him sound more like himself, though the Josu she remembered had never been truly angry with her. You did this to me. She was right: her corrupted healing spell had somehow allowed Belzenlok to raise him. You know I only wanted to help you. I was tricked, my magic— She stopped herself. It was a trap, to talk to him in this form. They couldn't truly speak until she freed him from this curse. She took the first step up toward the main hall. He surged after her and she ran up the steps, across the floor to the spot where Belzenlok had performed his spell. She turned and Josu was nearly on top of her, looming over her, his warhammer lifted. She gripped the Chain Veil. The Onakke bound into the Chain Veil whispered in her mind as she drew on raw power. She was vaguely conscious of the undead all over the Morass dropping like stones as the Veil drew off the necromantic power that animated them. The lines on her body began to burn, but she could see Josu clearly now, a smaller figure buried in the encasing armor, the man he had been before her spells had destroyed his life, before Belzenlok had transformed him. His dark hair and pale skin, features so much like her own. That's impossible, she realized. He was using dementia magic on her, clouding her vision. She had to act now. The power of the Onakke in the Chain Veil flowed through her like a blast of fire. It was gone in an instant, taking her strength with it. She stumbled, her body suddenly as weak as an unstrung puppet. She wanted to drop to the ground, but crumpled before her on the paving stones was the decomposing corpse of her brother. He looked up at her with empty eyes. Wan gray daylight let her see the bones through the gaps in his desiccated skin. Dazed, she looked up, realizing the entire top half of the main hall was gone. Belzenlok's necromantic power had held it intact and the Chain Veil had blasted it all away, aging the house until it was a crumbled ruin. She was uncertain how much time had passed, but through the gaping holes in the front wall she could see Rael and her Benalish soldiers gathered on the forecourt, and Gideon cautiously climbing the steps. She trembled with exhaustion and blood ran from the lines of her pact. She knew Josu's presence here was temporary, just the dissipating remnants of his soul and body. In a moment he would be gone, laid to rest. Not sure if he could hear her or not, she said, "Josu, it's all right. It's over. The curse of the House of Vess is ended." But his bony jaw dropped open and he rasped, "It cannot end, Liliana. Not while you still live." The raw hatred in his voice shocked her. "What do you mean?" What was left of his lips formed a sneer. "You destroyed the House of Vess, Liliana"
She shook her head. He must be confused, his memory affected by Belzenlok's spells. "Josu, I wasn't here—"
"Of course you weren't." Josu's voice strengthened, even as his body failed. "What do you think happened after you left? They died. All of them. Father tried to lay me to rest. I killed him myself. Mother took our sisters away, searching for a cure for me. And searching for you. She thought you lived, thought you'd been stolen away. She followed a rumor of magic that could save me and the journey killed her. Others took up the burden, our sisters, our cousins, trying to stop me, to destroy me. All of them died." He was fading now, fragments of his body disappearing into windblown dust. "You killed me. You killed them. It is you, Liliana. It will always be you. You are the curse of the House of Vess." Liliana staggered under the weight of his words. He had been undead all this time, all these years. Cold shock washed over her. It was horrifying. And worse still, her family, all dead trying to end the evil she had created. It was an accident, she told herself. I was tricked. But that didn't matter. The outcome had been the same as if she had deliberately set out to destroy her family. Gideon came toward her. 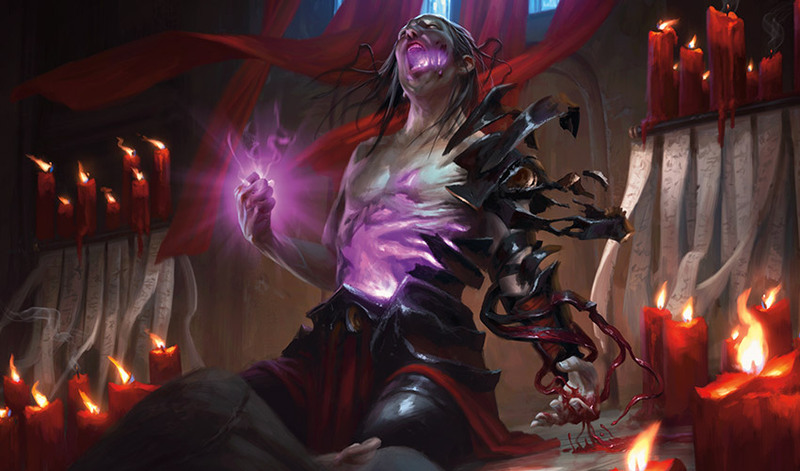 His expression was shocked, and he said, "Liliana, I'm sorry—"
He heard it, he heard all of it, she thought, reeling. But she set her jaw and refused to be humiliated. As he reached for her arm to steady her, she shook her head and took a step back. She forced her spine to straighten. She wouldn't weaken. She had survived worse than this. And Belzenlok would pay for his part in it. Pay for her brother's suffering. Pay for the realization that she had caused her family's destruction. Her voice hard with fury, she said, "If Belzenlok thinks this will stop me, he's a fool. I will pry open his Stronghold, slaughter his grimnants, and destroy his legacy. No matter what it takes. If I must be a curse, then let me be Belzenlok's!"